The Sixth Extinction – Milieu de la Moda, Inc. In The Sixth Extinction, author Elizabeth Kolbert, a staff writer for the New Yorker magazine, weaves together interviews with scientists to discuss prehistoric extinctions, such as the end of the dinosaurs, and then to link them with current extinctions caused by people. Her thesis is that people are causing a sixth mass extinction, where the number of species sharply declines. With the book’s format of interviews with scientists, I lost the big picture of the five mass extinctions that came before us. This isn’t a big deal, but the book’s title of six extinctions, might lead some readers to ask what the first five were. For those interested, the wikipedia article on mass extinctions has a much clearer summary of the five mass extinctions than I found in The Sixth Extinction. 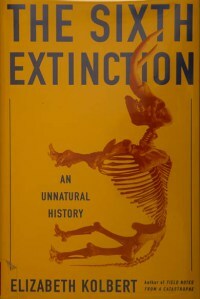 Kolbert does a excellent job portraying current extinctions caused by man.